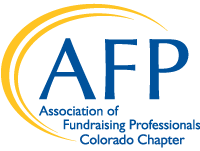 Thank you members, volunteers, and sponsors to AFP Colorado! Our special thanks to those below for making 2018 a spectacular year for AFP Colorado. Thanks to our National Philanthropy Day Chair – Jane Marsh and our RMPI Co-Chairs Monica Colbert and Cindy Grubenhoff. Thanks to Fluid Coffee Bar for donating meeting space every month for our Coffee Chats. And thanks to Drip Coffee for donating meeting every month for our ELI Development Professionals Group. Thanks to our 2018 Coffee Chat presenters, educational luncheon presenters, and RMPI speakers. Thank you to our RMPI sponsors: Dini Spheris, Children’s Hospital Colorado Foundation, The Kellogg Organization, Greater Giving, and more here. Thank you to our NPD sponsors: Rose Community Foundation, Daniels Fund, Great-West Financial and Empower Retirement, Delta Dental, Noble Energy, SCL Health and more here. Thanks to Community Shares of Colorado for partnering with us on the Executive Leadership Institute - Development Professionals Group. Thanks to Daniels Fund and Community First Foundation for the use of free conference space for our AFP Board of Directors and National Philanthropy Day meetings. AFP Colorado Chapter is proud to have a long-standing partnership with The Colorado Planned Giving Roundtable. CPGR is focused on increasing the quantity and quality of charitable planned gifts in our community. CPGR organizes many educational offerings throughout the year. AFP also partners with Colorado Nonprofit Association, focused on serving nonprofits and strengthening communities. CNA organizes many educational offerings throughout the year and AFP members can get a discount on regular sessions. AFP is proud to support the Institute for Leaders in Development at University of Denver and AFP members serve on the Steering Committee and in volunteer committee leadership positions.